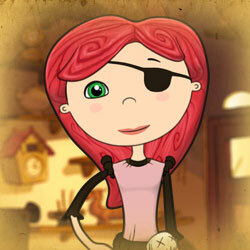 Nelly is a swashbuckling young pirate, and saviour of small cuddly animals. 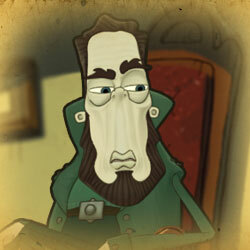 Nelly solves problems with wit, cunning and theft. She could definitely beat you in a fight, but her cutlass is at the dry cleaners right now. 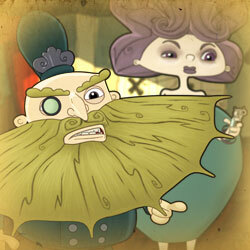 Nelly's ghostly mentor, Bloodbeard returns from Davey Jones's Locker to send her on quests. 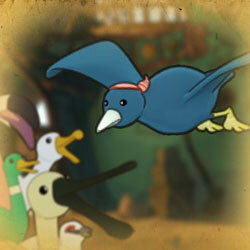 In his day, he was a fearsome buccanneer and the protector of all creatures small and adorable. 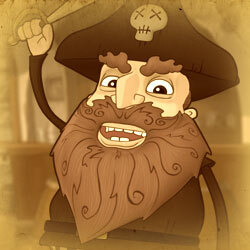 His lifelong rivalry with Baron Widebeard ended when his ship was lost in the Seventh Sea. Handsome, charming, talented. These are just some of the words used to describe Baron Widebeard, by Baron Widebeard. Other people will tell you he's a ruthless, bitter, serial bird-knapper. 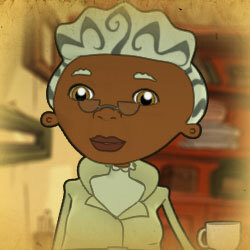 The Baroness is the driving force behind her husband's wicked schemes. Vain and ambitious, she's like Lady Macbeth if Lady Macbeth liked leopard print bikinis. The pitiless Groat Island Harbour Master strikes fear into the hearts of honest pirates. Van Zandt runs a ring of brutish privateers (licensed pirates) and he doesn't allow competition from enthusiastic amateurs like Nelly.